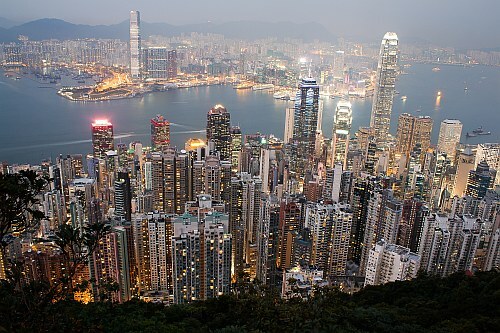 Delta has dropped the price of their flights from Edmonton to Hong Kong down to $539 CAD roundtrip including taxes. On FlightHub it's also worth trying dates that are *not* currently showing up as being cheap on Google Flights. So far I've seen $539 flights in all the months listed at the top of this blog post. Try starting with Wednesday to Wednesday dates, and then see the tip below about clicking on 'Flexible Dates'. NOTE: After your Flighthub search completes, you can try clicking on 'Flexible Dates' to look for other cheap date combinations. The fastest flights I've seen have a 5 hour stop in Seattle on the way there, with a 2 hour stop on the way home. There are also flights that have a full day layover (23 hours) in Seattle - for anyone that might want to visit Seattle as part of their trip. edmonton, yeg, flight deals, delta, hong kong, hkg, asia and east asia. 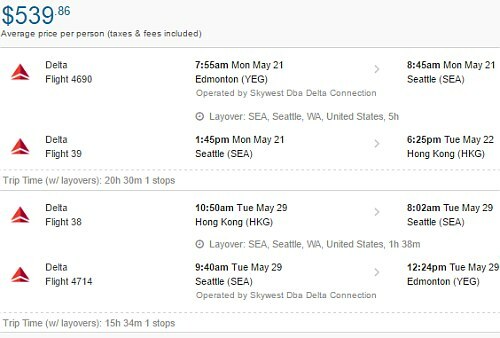 2 Responses to "Edmonton to Hong Kong - $539 CAD roundtrip including taxes (new record!)" Thanks for spotting these! I'm in Hong Kong right now, thanks to your post back a couple of months ago when Delta was asking $6XX. Couldn't have asked for better timings, and the flights are on A330s which are still comfortable in economy. No problem TJ! Hope you are having a great time in Hong Kong.